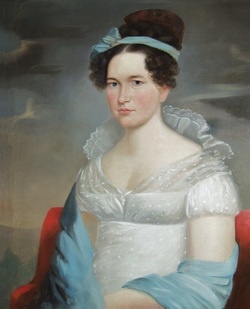 A young woman in 1795. It's been difficult for me to parlay the findings of my fourth Great-Grandmother. It was her son Jacob Cushman (my 3rd Great Grandfather), where I found her connection. For several years I researched who his father was. There were several Jacob Cushman's listed in the 1800 census. There were two others, a Jacob Cushman born in 1771, and another born in 1794. I knew that my 3rd Great Grandfather was born on January 22, 1792, because of the information that I had gathered from family bibles and validated with the census records throughout his life. So this was confusing when I found another Jacob Cushman born in 1794. It stumped me--for over a year. I placed a request in the Ancestry.com bulletin board area for some assistance. I heard nothing forr several months, but then I finally received an email from a distance relative who was finding the same "broken tree branch", just as stumped as me. She and I corresponded and then finally another distance relative connected with us, who lived near Plymouth, Massachusetts, and went and physically did the research by hand. It was she who found the connection. What it told us--OUR 3rd Great Grandfather, had been born out of wedlock! Judy Artley (the distant cousin I found on Ancestry.com) sent me the following information, which answered a lot of my questions. This ancestry line was in direct connection with the famous Mayflower families. I later was able to get confirmation from the Cushman DNA genealogy group, with the assistance of my Uncle Raymond Cushman (he contributed his DNA), that yes, we were connected. Sarah Besse, Single Woman (Bridgwater) v. Jacob Cushman (Middleborough Labourer). Besse appeared in court with her attorney Seth Paddleford Esq. and made oath, as she had done before Benjamin Willis, JP, and during her labor, that the child she bore on 22 January was "begotten by Jacob Cushman." Cushman appeared with his attorney James Sprout Esq. and pleaded not guilty. Jury verdict, guilty (Jurors: Ozborne Morton and Fellows, vizt, Joseph Jennings, Lathrop Turner, Isaac Jackson, Isaac Bisbee, Nathaniel Fish, Joseph Cobb, Benjamin Paterson, John Cobb, Daniel Tucker, Samuel Bonney, and Benjamin Thaxter"). What amazing strength Sarah Besse had to have in order to go through the courts to seek child-support with a jury trial. (It seems society hasn't changed much since.) In 1792, it she had no other recourse. The embarrassing stigma of being a woman from a well-known family (the Besse family has deep history in Massachusetts). She was the 7th child of eight that were born to Nehemiah Besse and Sarah Perry. She must have had some kind of money to do this, because a lawyer was used, and the jury demanded, that Jacob Cushman - a labourer - to pay her child support. Through my review of more census records, I further concluded that Jacob Cushman, did marry and relocated to Rhode Island. He named is first son, Jacob Cushman, who was born in 1794. Sarah's tenacity of standing her ground and getting the child support until she could get her self balanced says a lot about her character. In 1794, I found Sarah again, known as the widow Cushman, (who she had not married - so it was a bit of a lie) married to Gideon Maxham from Prompret, Vermont. They had seven children of their own, and were married 60 years before Gideon died at the age of 88. Sarah died three years later. It seems that perhaps her life direction and purpose was geared for this early bump. To live that long in those days says a lot to her lifestyle and the community she settled in. Sarah, let the records reflect that what happened to you impacted all of your descendants, even to this day. Thank you!